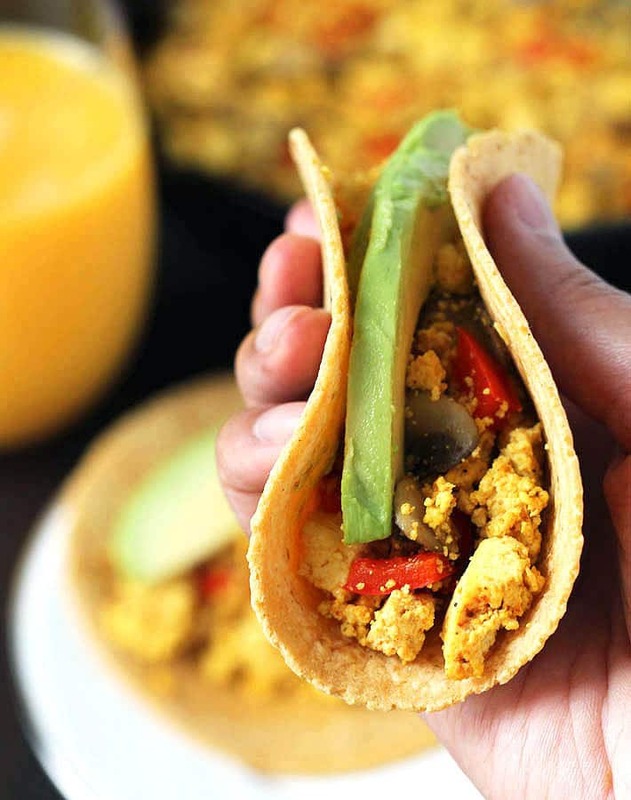 This Southwest Tofu Scramble Breakfast Tacos recipe is sponsored by Simply Organic (@SimplyOrganicFoods) for their #OrganicMoments campaign. As always, all opinions in this post are my own. This page contains affiliate links, click here to learn more. Around here, weekday breakfasts are usually simple and quick, but when the weekend rolls around, I like to make things that take a little more time, like waffles and pancakes. The beauty of these breakfast tacos is that they can be made either for a rushed morning breakfast or for a lazy weekend breakfast. To make them for weekday mornings, simply make the scramble the day before, cool, and refrigerate. In the morning, warm up your tortillas and the scramble, assemble, and you have yourself a hot, delicious breakfast! 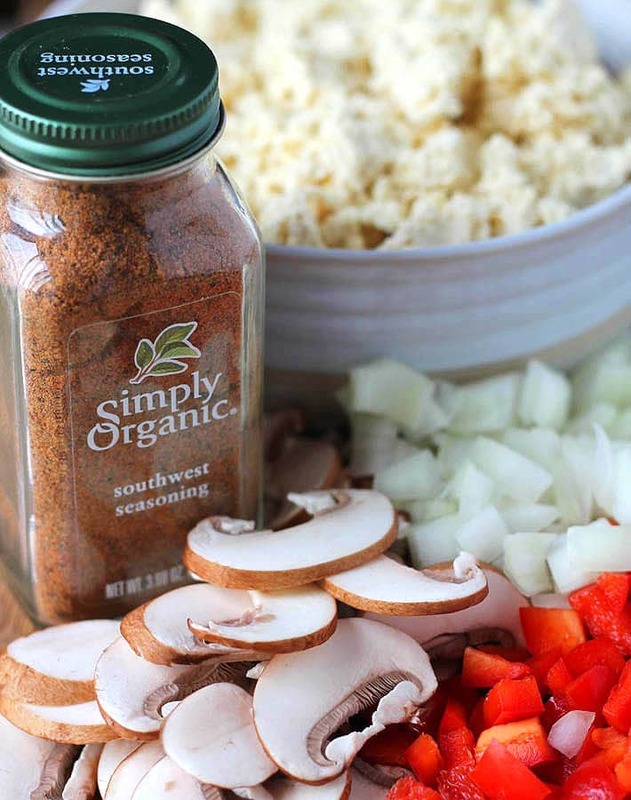 To make this recipe, you’ll just need a few ingredients, including Simply Organic’s new Southwest Seasoning. This smoky spice blend has a bit of kick from chipotle pepper and cayenne, and it also contains paprika, cumin, and lemon peel. So rather than having to combine several spices to achieve that Southwest flavour everyone loves, you have it all in one bottle. Super easy and convenient for any dish you want to infuse Southwest flavour into. So of course, I had to use it for my Southwest Tofu Scramble Breakfast Tacos! The seasoning gives the scramble a delicious boost of flavour that you’ll enjoy if you like spicy, savoury foods. Some other dishes this Southwest Seasoning would be great in: lentil tacos, chili, spicy rice, black beans, burritos, salsa, tostadas, and so much more! Now, these are called breakfast tacos, but they can be enjoyed any time of the day. The first time I made them, I had them for lunch. You also do not have to stick to them being tacos. You can serve the scramble with toast and fruit on the side, or you can add 1/2 cup of black beans to the scramble to bulk it up and make wraps with a side salad for supper. It’s really an any-time-of-day meal! Another way you can customize this recipe is to experiment with different toppings. Each time I’ve made them, I’ve topped them differently and my favourite way is always with just sliced avocados, and that’s it. Whatever you decide to top them with, they’ll be delicious! 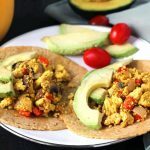 So get yourself a bottle of Simply Organic’s Southwest Seasoning and make yourself delicious Southwest breakfast scramble tacos for either a rushed weekday morning breakfast or a lazy weekend family breakfast…or even for lunch or dinner! And if you do make them, tag me on Instagram (@delightfuladventures), I’d love to see how you top yours! 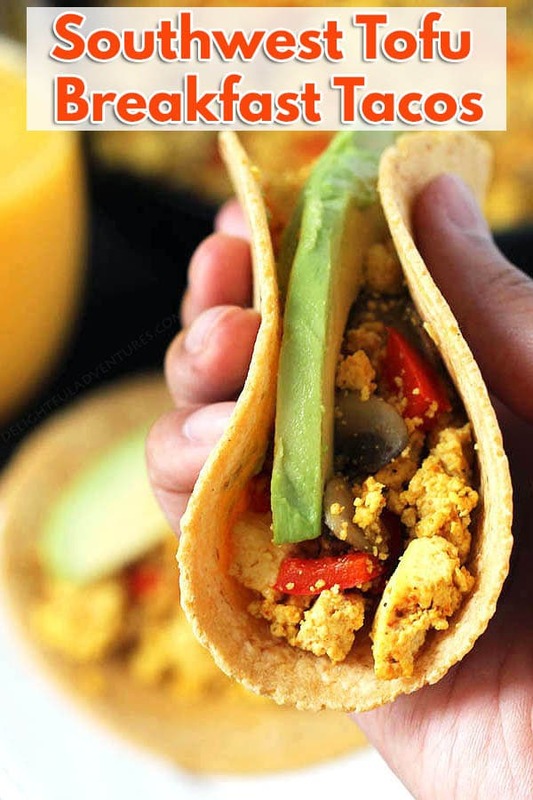 Make something different for breakfast by trying out these vegan Southwest Tofu Scramble Breakfast Tacos filled with veggies and spicy flavour! Heat a large-sized pan over medium heat. Once the pan is hot, add two tsp of the oil to the pan and let heat for a few seconds. Add onions to the pan. Cook for 1 minute. Add red pepper and mushrooms to the pan and cook for another few minutes until everything is tender but not too soft. Spoon out vegetables into a bowl and set aside. Add the remaining tsp of oil to the same pan, add crumbled tofu and turmeric and stir until tofu is evenly coated with the turmeric. Add southwest seasoning and salt, mix until combined. Cook for another 5 minutes, or until the tofu starts to brown slightly. Add vegetables back to the pan and stir until everything is combined. Remove the pan from the stove. Warm tortillas and assemble breakfast tacos, topping with garnishes of your choice. See note below for ideas. Nutrition info is based on 1 taco with the recipe made as written and with no toppings. Nutrition info is only to be used as a rough guide. Click to learn how nutrition info is calculated on this website. I never thought of substituting the tofu instead of eggs for a healthier breakfast taco! I have been trying to eat less eggs and this seems like the perfect recipe to try. Just started a Vegan diet. This is the perfect recipe. I’ve never tried tofu, but this looks delicious! Thanks, Dawn! It’s a good recipe to start with tofu 🙂 If you try it, I hope you like it! Love this idea! 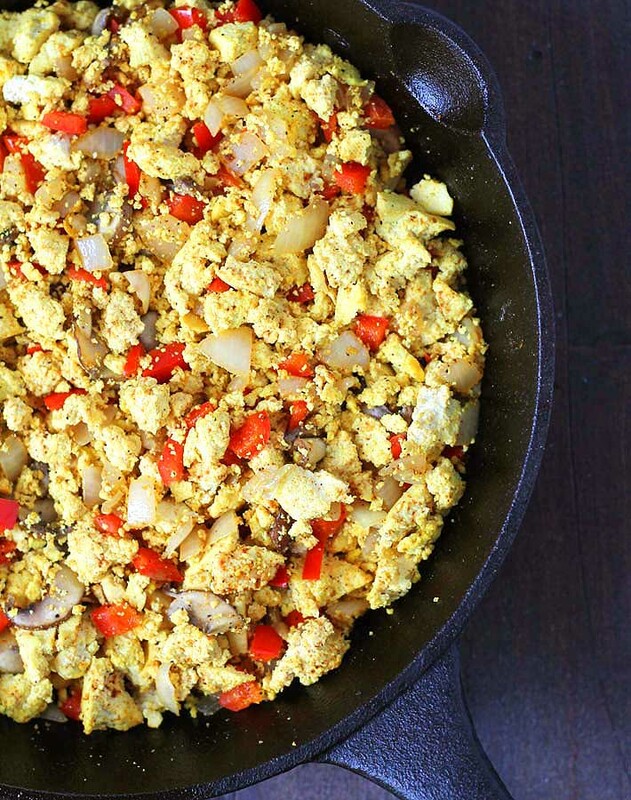 Tofu scrambles and southwest flavors are my jam so these are perfect for me! This was the first thing that came to mind to make when I saw the Southwest spice! These are some of my favourite things, too 🙂 Thanks, Mary Ellen! These tacos look awesome! I need to pick up some of that Southwest Seasoning! Thanks, Amy! The blend is so convenient since I don’t have to mix a bunch of spices to get that same flavour. Love it! I love having tacos for breakfast! These look so tasty! I love having one seasoning blend to use, rather than having to pull lots of different jars out of the pantry. I love a hearty breakfast taco! Simply Organic is the best and I’m pretty sure I need this Southwest Seasoning among my spice collection!